Cambridge saw their lead at the top of the Conference Premier cut to one point as they suffered only a second league defeat of the season at Hereford. Michael Rankine scored the only goal, capitalising on a mistake in the U's defence to fire left-footed past keeper Chris Maxwell and in off the post. Cambridge had chances to level but Josh Gillies curled a shot wide and Adam Cunnington fired into the side netting. Second-placed Luton cut the U's lead at the top with a 4-2 win over Gateshead. Match ends, Hereford United 1, Cambridge United 0. 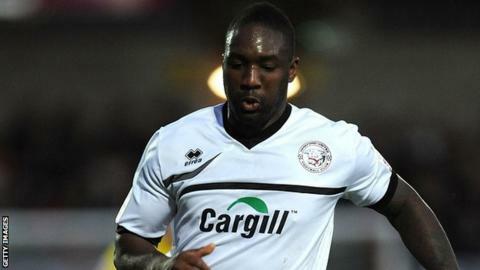 Second Half ends, Hereford United 1, Cambridge United 0. Attempt blocked. Dan Walker (Hereford United) right footed shot from outside the box is blocked. Foul by Dan Walker (Hereford United). Harrison Dunk (Cambridge United) wins a free kick. Attempt missed. Delano Sam-Yorke (Cambridge United) right footed shot from the left side of the box misses to the right. Hand ball by Michael Rankine (Hereford United). Offside, Hereford United. Dan Walker tries a through ball, but Dan Walker is caught offside. Attempt missed. Josh Gillies (Cambridge United) left footed shot from outside the box misses to the left. Chris Maxwell (Cambridge United) is shown the yellow card for a bad foul. Josh Coulson (Cambridge United) wins a free kick. Attempt missed. Adam Cunnington (Cambridge United) right footed shot from the right side of the box misses to the right. Attempt missed. Richard Tait (Cambridge United) left footed shot from outside the box misses to the left. Adam Cunnington (Cambridge United) wins a free kick. Substitution, Cambridge United. Michael Spillane replaces Ian Miller. Dan Walker (Hereford United) wins a free kick. Dominic Collins (Hereford United) is shown the yellow card for a bad foul. Substitution, Hereford United. Dan Walker replaces Micah Evans because of an injury. Foul by Delano Sam-Yorke (Cambridge United). Attempt saved. Micah Evans (Hereford United) right footed shot from the left side of the box is saved. Attempt missed. Delano Sam-Yorke (Cambridge United) right footed shot from the right side of the box is too high. Attempt missed. Micah Evans (Hereford United) right footed shot from outside the box is too high. Substitution, Cambridge United. Richard Tait replaces Kevin Roberts. Michael Rankine (Hereford United) wins a free kick. Substitution, Cambridge United. Delano Sam-Yorke replaces Nathan Arnold. Second Half begins Hereford United 1, Cambridge United 0.